You can buy a professional object permanence box for about $20 to $30 on Amazon, but I couldn’t justify the expense. 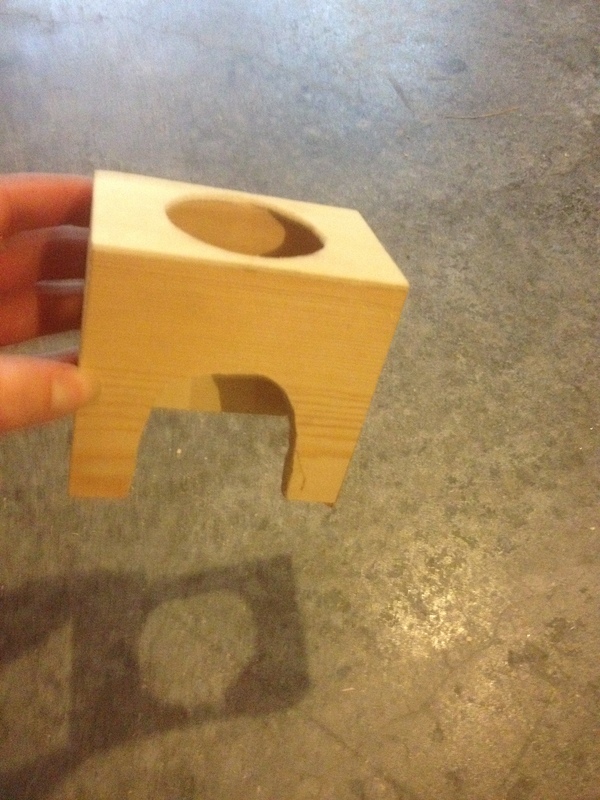 So I decided to make my own object permanence box! First I took a trip to hobby lobby…. The small crate was 4.99. 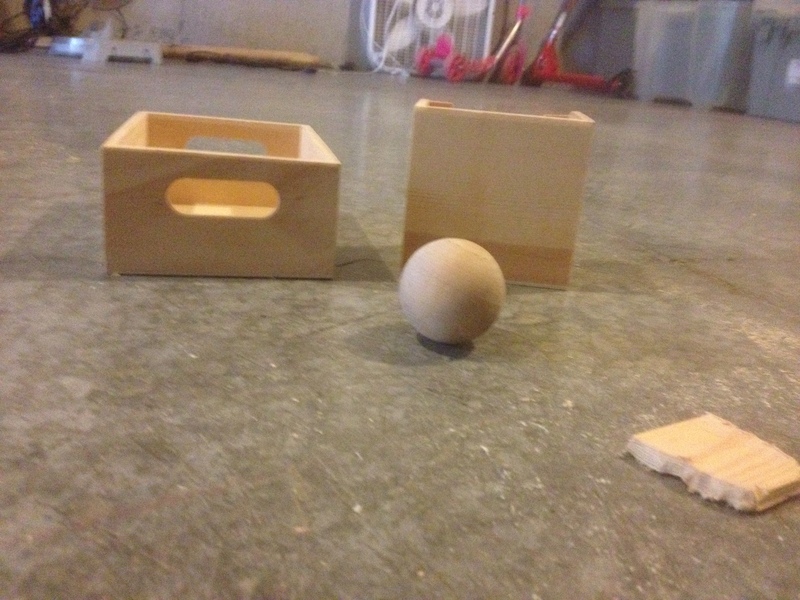 The box to drop the ball into is a 1.99 wooden box turned upside down. It had a rope handle that I removed. The ball is slightly smaller than 2″ across as I was worried about a choking hazard. I got 6 balls for 3.99, bringing our total to about $8 for materials used, $11 with the extra balls. Using a dremel, I carved out a not-quite-perfect arch in the front and hole in the top. Then I used wood glue to attach the arch to the bottom crate. 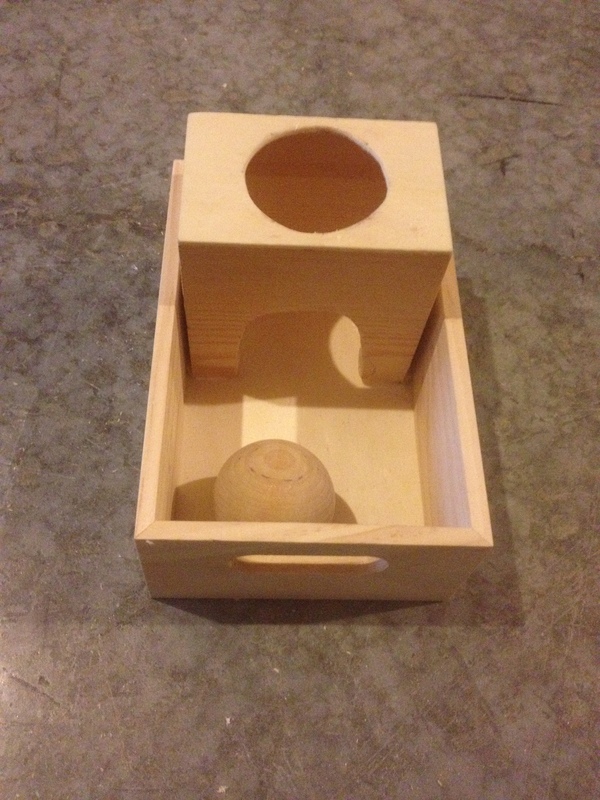 I sanded the entire thing and presented it to N.
N has a hard time using this if she is tired/sick- she finds it frustrating that she cannot pull her hand out of the hole if she’s holding the ball. I might recommend creating a wedge to place under the tray for younger babies so that the ball will roll out. When she’s in a good mood, N loves this- and, it doubles as a hiding spot for stuffing other items! This entry was posted in Uncategorized on September 18, 2014 by centrificalhooper. I’m coming late to this Montessori challenge, but I thought it would be a perfect bandwagon to jump on as I was planning on tracking our journey into Montessori anyway. Since moving four short weeks ago, J and I have been working hard to implement many self serve areas for the children. But, in the spirit of this challenge, I looked for a new place that could use improvement which would be quick (less than 30 minutes) and inexpensive. I decided on the “condiments” section of our refrigerator. L (6) and M (5) are working on packing their own lunches for school this year. Condiments have caused a problem because they inevitably 1) get too much and 2) spill it all over their box during transport to school. My solution was to get 4 of the 3oz bottles from the travel section of Wal-Mart. Our policy is to refill them once per week- so if the kids use too much, they will run out early in the week. 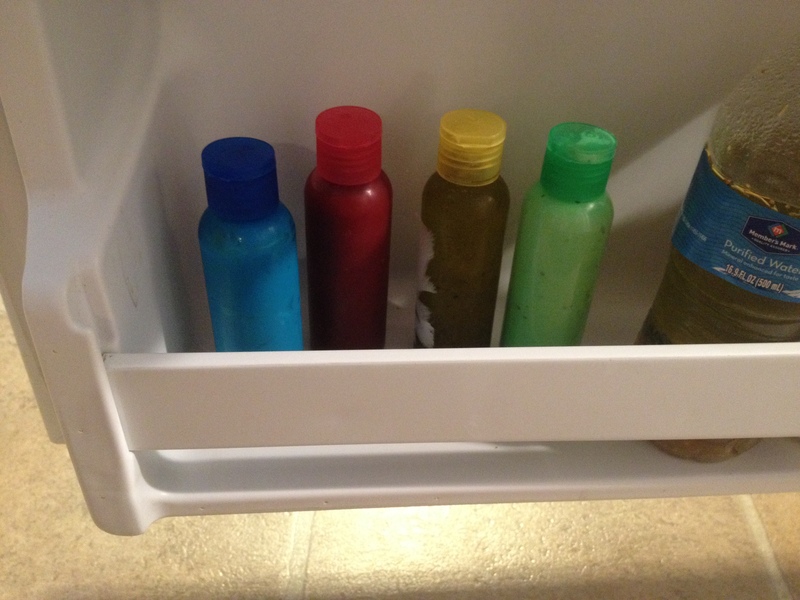 The bottles are on the lowest shelf in the door of the refrigerator. They also fit perfect in the kids lunch boxes, so they can take the whole thing! This one made me think! We have been encouraging the kids for about a year to sit down to eat, stay until they’re finished, and to put their dishes in the kitchen when finished. They still have trouble- daily- with wandering off during meals, but they are getting better at remembering without being verbally reminded to sit back down. I think I will take this into a little spin-off; encouraging the kids to have good habits when preparing their lunch. We need to work on bringing one item at a time to the table, packing a food item and putting it away before moving to the next item, and cleaning up materials when all done. Look for an update on this, probably around Sunday when we pack Monday’s lunch. J and I purchased some glass pitchers and cups over the summer for the kids to use. However, they have been using plastic water bottles since they came home from mom’s this summer. Today I showed them our pitcher and cups, and allowed them to pour the water for each other. There were a few spills, but it worked out alright. L cleaned up his spill with cotton balls he had brought home from school (where they had been used to wipe the leaves of his plant). I also allowed N (10 months) to use a shot glass at lunch time. She immediately spilled it on the floor while trying to bring it to her mouth- and I’m okay with that. I think if I set it carefully and nicely on her table at each meal, it will give her a chance to practice using it. That’s it! Hope to see some other responses! This entry was posted in Montessori and tagged #30daystomontessori, montessori, real materials, self serve area, table manners on September 5, 2014 by centrificalhooper. It’s been awhile since I checked in. This summer we’ve made a lot of changes- we’ve moved back up near the airport, a better location for us, and enrolled L and M in a Montessori school that goes up to eighth grade. N is nearly 10 months and is walking, chattering (“up!” “uh-oh!”), and generally letting her opinions be known. The summer was a crazy event in which we sold and donated at least a third of our possessions to ease our move and contribute to a simpler lifestyle. The bad news is our house hasn’t sold yet, so we’re currently paying two mortgages. My husband J has started a new job just this week and I’ve started grad school, semester 2 of 12. So it’s crazy here. This entry was posted in General, Minimalism, Montessori and tagged DIY, montessori, Non-religious, Religion, SAHM on September 3, 2014 by centrificalhooper. On New Years my friend K asked me what my resolution was. It wasn’t about my job, my weight, or any of the normal stuff. I told her I wanted to have meaningful experiences with the people in my life. That’s all. Since then I’ve left my job (and I loved working) to stay at home with my infant, my husband has left his job to work in our home office as a contractor, and my step daughter has left La Petite to be home with me. And to top it all off, my bright, awesome, kind stepson is having trouble in kindergarten- and I have to think it’s because he’s bored. This is a kid who loves math but gets in trouble in math club every day. Talk about experiences! All this time together in our house has helped my husband and I to realize that we aren’t living the life we want to be. Our 4 bedroom house with two living areas, basement, and two car garage has started to seem overwhelming when we’re actually in them every day. And the STUFF that builds up is just incredible. We’re in search of a different life. A simpler life in a simpler environment that encourages connection and experiences. Right now, for us, our environment detracts from that ability. Not to mention our expenses. So we need a change and so do the kids. We want to have the extra funds to DO things instead of have stuff. We want to be able to send the kids to a school that lights a fire in them, a love of learning- even if it’s more expensive. Yet right now our utilities, mortgage, and purchases just make that impossible. So we’re going to try minimalism…or, as I read somewhere “MinimalISH”. We’re going to explore Montessori for the kids. And we’re going to focus on having experiences together- meaningful experiences. Because I don’t want my kids to remember childhood as seeing the back of my head as I clean dishes and bark at them to pick up toys. This entry was posted in General, Minimalism, Montessori on May 15, 2014 by centrificalhooper.